As previously explained, there are generally very few abuse of dominance interventions in the Netherlands. In 2017, one violation was established by the ACM. In 2017, the ACM saw its first case of predatory pricing in a tender procedure, imposing a fine of nearly €41 million on Dutch Railways (NS) for abuse of dominance in a regional tender process.16 According to the ACM, NS wanted to prevent its competitors from winning the tender at all costs, because the tender process served as a pilot for a further decentralisation of the main railway network. NS was found to have abused its dominant position on the main railway network in two ways, first by submitting a loss-making bid for a public transport contract in the Dutch province of Limburg. The second infringement related to a combination of conduct aimed at setting competitors at a disadvantage. The conduct consisted of using confidential information obtained from a former director of one of its competitors, providing delayed and incomplete responses to competitors’ access requests to certain services and facilities owned by NS, and passing on confidential information about its competitors to its subsidiary, which also participated in the tender process. NS intends to appeal the decision. The case law in the Netherlands has been too fragmented to be able to deduce any clear trends; however, both the ACM and the courts in the Netherlands try to adhere closely to the Commission’s and EU courts’ application of the concept of abuse of dominance, and have been following the Commission’s lead in emphasising the importance of an effects-based analysis and attaching great value to economic evidence in abuse cases. In the Netherlands, the concepts of market definition and market power are applied in a manner that is substantially similar to the approach of the Commission and the EU courts; therefore, see the European Union chapter for more detailed information on European practice. The ACM and the courts will normally also look for contraindications, such as countervailing power, when determining dominance. As with the concepts of market definition and market power, the ACM and the courts tend to closely follow the case law of the Commission and EU courts on the concept of abuse. There are no substantive areas in which Dutch practice may be said to clearly deviate from European practice. Still, over the years, some noteworthy decisions have been handed down with respect to the various types of abuse within the abuse of dominance spectrum itemised below. As stated in Section II, the ACM concluded its first predatory pricing case in a tender procedure in 2017 with the imposition of a €41 million fine on NS for submitting a loss-making bid for a public transport contract in the Dutch province of Limburg. Instead of an ex post comparison of actual costs and actual revenue, the ACM had to use an ex ante approach to determine predation, because the case related to a bid for a concession that was ultimately not awarded to NS. The ACM compared NS’s internal rate of return (IRR) when performing the concession with its weighted average costs of capital (WACC), and concluded that the IRR would be lower than the WACC. As a result, the concession’s expected revenue would be insufficient to recover the anticipated costs. According to the ACM, this made it impossible for as-efficient competitors to match or outbid the NS bid without incurring loss. In the CR Delta case, the ACM held, inter alia, that certain rebates granted by the (dominant) Dutch ‘cattle improvement co-operative’ on its insemination services were of a loyalty-inducing nature and, therefore, anticompetitive. This view was later confirmed by the District Court of Rotterdam.25 However, the Trade and Industry Appeals Tribunal (CBb), the highest administrative court in cases on appeal of decisions from the ACM, ruled (in 2010) that despite the obvious loyalty-inducing aim of the rebates, the ACM should have examined whether the rebates were capable of having anticompetitive effects before concluding that the rebates were illegal (referring to the Tomra jurisprudence of the ECJ). According to the CBb, the rebates were not capable of having such effects, as the rebates only accounted for a very small (merely ‘symbolic’) part of the total costs. Moreover, according to the CBb, competitors were able to (profitably) match the prices charged by CR-Delta, which according to the CBb clearly indicates the absence of any exclusionary effects of the rebates. For these reasons, the CBb overturned the decision of the ACM. On the subject of refusal to deal, NVM/HPC confirms that the Dutch courts closely follow the Bronner criteria in their assessment of such cases. In June 2012, the Amsterdam Court of Appeal handed down a decision in a case between the Dutch Association of Real Estate Agents (NVM) and the (bankruptcy trustee of) software company HPC. HPC submitted that the NVM had illegally refused access to technical specifications necessary for third-party software packages to interface with a widely used software system supplied by the NVM. The Court first considered that the case law of the EU courts should be ‘guiding’ in applying Article 24 of the DCA. It then proceeded to assess the cumulative criteria of Bronner28 to determine whether the alleged (constructive) refusal to deal should be held abusive. It ruled that HPC had not been able to convincingly demonstrate that all competition had been eliminated by NVM’s alleged refusal; and that having access to the specifications was the only way of building a market presence in view of, inter alia, the fact that HPC had been active on the market with a market share of about 20 per cent. It therefore rejected the abuse of dominance claim.29 The Dutch Supreme Court upheld the Court of Appeal’s ruling and, referring to EU case law, rejected the plaintiff’s argument that not all competition will need to be eliminated for it to constitute abuse.30 According to the Supreme Court, the Court of Appeal rightly deduced that competition by HPC, and thus competition on the market, was not completely eliminated by the NVM’s behaviour, given HPC’s 20 per cent market share. Perhaps the different rulings of the CBb and the Supreme Court in the case of De Telegraaf v. NOS could be explained by the fact that, unlike in the Magill case, the ‘new product’ criterion was clearly presented as a cumulative criterion in IMS Health, which was issued only after the Supreme Court’s decision. However, it still remains doubtful whether, in view of Magill alone, the Supreme Court was right to endorse the lack of a more specific assessment of the new product criterion by the Court of Appeals and consider it satisfied by referring to the existence of a demand for the product. In March 2018, the District Court of Amsterdam dismissed the claim by real estate association VBO that online real estate platform Funda provided preferential treatment to real estate association NVM, co-founder and indirect shareholder of Funda, in terms of, inter alia, costs and ranking on its website. The District Court first underlined that applying dissimilar conditions to equivalent transactions with other trading parties only qualifies as abuse if it thereby places them at a competitive disadvantage. As a result, for conduct to qualify as abuse there must be a finding not only that the dominant company’s conduct is discriminatory, but also that the dominant company’s conduct tends, having regard to the whole of the circumstances of a case, to lead to a distortion of competition between business partners. In this context it is particularly necessary to examine whether the discrimination is likely to have a negative effect on the ability of trading partners that are disfavoured to exert competitive pressure on trading partners that are favoured. The District Court found that VBO had failed to demonstrate that the discrimination tended to distort its competitive position. As a result, the Court concluded that it could not be established that Funda had abused its dominant position. In December 2014, the ACM closed its investigation into possible abuse of dominance by pharmaceutical manufacturer AstraZeneca. In December 2011, the ACM sent a statement of objections to AstraZeneca, suspecting it of having abused a dominant position by charging considerably higher prices for its heartburn drug Nexium sold for use outside hospitals (extramural) than when sold inside hospitals (intramural). As a result of the ‘hospital-influence effect’ – patients tend to continue using the same drug that they have been administered by their hospitals, and physicians are inclined to prescribe the same drug – AstraZeneca allegedly faced little competition with regard to patients that had first been put on Nexium while hospitalised, and could thus offset the losses incurred by offering Nexium to hospitals at a deep discount with higher extramural prices. The ACM concluded, however, that AstraZeneca had not violated the prohibition on abuse of dominance because it could not be sufficiently determined that AstraZeneca had indeed held a dominant position. In its decision, the ACM distinguished an intramural market and an extramural market consisting of users who, as a result of the hospital-influence effects, should be considered captive to Nexium. AstraZeneca did not have a dominant position on the intramural market since it held a market share of less than 40 per cent. Regarding the extramural market, AstraZeneca’s arguments regarding substitution, therapeutic effectiveness and switching behaviour had raised reasonable doubts as to whether a group of Nexium users would indeed be bound to Nexium through the hospital-influence effect on such a scale that, with regard to this group, AstraZeneca was able to behave independently of its competitors. In April 2014, the ACM published a commitment decision relating to a possible abuse of a dominant position. In addition to the statutory law, the ACM relies on policy rule concerning the determination of fines: the 2014 ACM Fining Policy Rule issued by the Ministry of Economic Affairs.48 The fine calculation method applicable to infringements of the cartel prohibition and the abuse of dominance prohibition that follows from these guidelines resembles the EU approach (as laid down in the Fining Guidelines of the Commission49) in several respects, but not entirely. According to the Fining Policy Rule, the basic fine is calculated as a percentage (of zero to 50 per cent) of a company’s turnover during the last full year of the infringement multiplied by the number of years and months the infringement lasted. In setting the fine, the ACM will take account of aggravating or mitigating factors. Fines may reach up to a maximum of €900,000 or, if greater, 10 per cent of the worldwide annual turnover of the undertaking concerned. The ACM may examine infringements of Article 24 ex officio or on the basis of a complaint. The ACM will apply its prioritisation policy in deciding whether to pursue a case (see Section I). There is no fixed time limit for an investigation. It may take months, but will usually take longer. The investigation is carried out by a case team at the ACM Competition Directorate. If an infringement is established and it is subsequently decided to pursue the case, a report will be issued. This type of document is similar to a statement of objections. The addressed undertaking (and other interested parties, such as complainants) will have the opportunity to present its views on the allegations in the report, in writing and at an oral hearing.52 The legal department of the ACM presides at the oral hearing. The department acts partly as an internal review body ‘independent’ of the case team of the Competition Directorate. It has no involvement with the investigation and the drafting of the report, and is tasked with the preparation of the decision subsequent to the oral hearing. Ultimately, however, the board of the ACM decides whether to issue a (fining) decision. The stage from the launch of the investigation until the issuance of a decision (establishing an infringement) can take a long time in the Netherlands. The duration is rarely less than a year. Decisions of the ACM may first be submitted to administrative review before an ‘independent’ administrative review committee (administrative review), which will render an opinion to the ACM. The subsequent (renewed) decision of the ACM may be appealed to the District Court of Rotterdam. Ultimate appeal lies with the CBb. Parties may agree with the ACM to directly appeal the ACM’s decision before the District Court so that there is no need to follow the administrative review procedure. Because of the elaborate appeal procedure in the Netherlands, as described above, it often takes a very long time (i.e., more than three years) from the date of a decision of the ACM until the date of a decision of the appellate court, the CBb. There are no formal procedures for obtaining guidance on individual cases. It is possible to informally sound out the opinion of the ACM (e.g., in a meeting). A consultation on a bill to also apply these provisions to civil damages actions in cases solely featuring infringements of domestic competition law was closed in November 2017.56 For now, general Dutch tort law applies to such actions. Pursuant to Dutch tort law, claimed damages can only be compensatory in nature: there is no such thing as punitive or ‘treble’ damages in the Netherlands. Private enforcement of Article 24 of the DCA is attempted relatively frequently in the Netherlands, but these attempts are mostly unsuccessful. Claimants often fail to meet the evidentiary thresholds. As explained above, Dutch courts tend to follow EU practice and trends, and therefore attach considerable weight to economic evidence. Claimants only rarely make the effort of building a convincing economic narrative to support a claim of abuse of dominance. The ACM has stated that the price of prescription drugs will be a key priority for 2018 and 2019. The ACM will thus likely be focusing on excessive pricing in the pharma sector in the near future, and enforcement rates in this area may increase as a result. 1 Martijn Snoep is a partner at De Brauw Blackstone Westbroek NV. 2 Although such an exemption has to be applied for and granted by the ACM to take effect under Article 25 of the DCA. 3 Explanatory Memorandum to the Dutch Competition Act, No. 24 707, p. 71. 6 See, for example, the decision of the Dutch Competition Authority, the NMa, of 12 September 2002 in case No. 2493 (Vereniging Eigen Huis v. Gemeente Amsterdam), in which the municipality of Amsterdam was held to be an undertaking insofar as it was involved in the sale of land. start-toezicht-Wet-Markt-en-Overheid/. A transitional exemption period of two years applies with respect to activities already started at the moment this legislation came into force. 8 The Health-care Market Regulation Act is available (in Dutch) at www.nza.nl/regelgeving/wetgeving/wmg. 9 Amendment of the Healthcare Market Regulation Act (Wijziging van de Wet marktordening gezondheidszorg en enkele andere wetten in verband met aanpassingen van de tarief- en prestatieregulering en het markttoezicht op het terrein van de gezondheidszorg), Parliamentary paper 34445. 11 Case No. 3353, decision of the NMa of 6 March 2008; and the decision of the Trade and Industry Appeals Tribunal of 7 October 2010 (case AWB 07/596, LJN: BN9947) (CR-Delta). 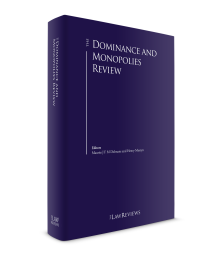 12 The study mentions that the following hypotheses could not be proven: (1) differences in the tools and resources available to the five competition authorities and their deterrent effects; (2) whether Dutch firms have violated the abuse of dominance provision to a lesser extent, as compared to other jurisdictions; and (3) the explanation that the Dutch Competition Authority NMa chose to intervene in few abuse of dominance cases in the period studied, or resolved a relatively high number of cases informally. 13 Prioritisation policy of the ACM, available (in Dutch), Stcrt.2016 No. 14564 of 18 March 2016. 16 Case No. 16.0691.31, decision of the ACM of 22 May 2017. 17 SEO study, p. 15. 18 Commission Notice on the definition of relevant market for the purposes of Community competition law  OJ C 372/5. 19 European Court of Justice 14 February 1978, Case C-27/76 (United Brands/Commission). 20 This also follows from the Explanatory Memorandum to the Dutch Competition Act, No. 24 707, p. 25. 21 Decision of the District Court of Amsterdam of 21 March 2018, ECLI:NL:RBAMS:2018:1654. 22 Case No. 6207, decision of the NMa of 21 May 2012. 23 See paragraph 67 of the Commission’s Guidance on enforcement priorities in applying Article 82 of the EC Treaty to abusive exclusionary conduct by dominant undertakings  OJ C 45/7. 24 Decision of the District Court of Rotterdam of 26 September 2013, ECLI:NL:RBROT:2013:7337. 25 Decision of the Trade and Industry Appeal Tribunal of 7 October 2010, AWB 07/596, LJN BN9947 (CR-Delta). 26 Case No. 4296_1, decisions of the NMa of 5 January 2011 (213), 21 January 2011 (197) and the decision on appeal of the NMa of 30 June 2011 (214) (GasTerra). 27 Case No. 5702, decision of the NMa of 20 July 2007 (207). 28 European Court of Justice 26 November 1998, Case C-7/97 (Bronner). 29 Decision of the Amsterdam Court of Appeals of 12 June 2012, LJN: BX0460. 30 Decision of the Dutch Supreme Court of 24 January 2014, ECLI:NL:HR:2014:149. 31 Case No. 501.o119, decision of the NMa of 3 October 2001 and decision of the District Court of Rotterdam of 22 June 2000, LJN: ZF1130. 32 Decision of the President of the District Court of ’s-Gravenhage of 5 January 1999, KG 98/1539, LJN: BM3036; decision of the Court of Appeal of ’s-Gravenhage of 30 January 2001, 99/1.65, LJN: AA9717; and decision of the Supreme Court of 6 June 2003, C01/183HR, LJN: AF5100. 33 Decision of the Supreme Court of 6 June 2003, C01/183HR, LJN: AF5100, paragraph 3.11. 34 European Court of Justice 29 April 2004, Case C-418/01 (IMS Health). 37 Decision of the Trade and Industry Appeal Tribunal of 24 May 2012, AWB 09/1302, LJN: BW6327. 38 Case No. 3295, Decision of the NMa of 10 May 2007 (78), and decision on appeal of the NMa of 2 April 2008, (133). 39 General Court of the EU 9 September 2010, Case T-155/06 (Tomra/Commission) and European Court of Justice 19 April 2012, Case C-549/10P (Tomra /Commission). 40 Decision of the Trade and Industry Appeal Tribunal of 7 October 2010, AWB 07/596, LJN BN9947 (CR-Delta). 41 Case No. 2910, decision of the NMa of 28 April 2004 (700). 42 Ibid., paragraphs 145, 202, 219–221. 43 Case No. 2910, decision on appeal of the NMa of 21 December 2005 (864), paragraphs 10, 12. 45 Ibid., paragraphs 15–16, 21–26. 46 See Act establishing the Authority for Consumers and Market (2012/2013, Nos. 1 and 2, 33 186). 47 These rules, laid down in the General Administrative Law Act, comprise the ‘right to remain silent’ and the ne bis in idem principle. 48 Policy rule of the Minister of Economic Affairs of 4 July 2014, No. WJZ/14112617, on the imposition of administrative fines by the Netherlands Authority for Consumers and Markets. Unofficial English version available at www.acm.nl/en/publications/publication/13315/Policy-rules-regarding-fines-and-leniency/. As amended by the Policy Rule of the Minister of Economic Affairs of 28 June 2016, No. WJZ/16056097. 49 Guidelines on the method of setting fines imposed pursuant to Article 23(2)(a) of Regulation No. 1/2003, OJ C 210, 1 September 2006. 50 Dutch Competition Act, Articles 56 and 58a. 51 ACM Policy Guidelines Administrative Fines, pp. 4–5. 52 Article 59 of the DCA in combination with the rules laid down in Chapter 5 of the General Administrative Law Act. 53 For example, in KPN v. NL.tree (22 March 2006), the District Court of The Hague ordered KPN to withdraw internet access offers to educational institutions that were deemed to be predatory and to amount to a price squeeze. The Court also ordered KPN to desist from making abusive offers in the future. 55 Wet van 25 januari 2017, houdende wijziging van Boek 6 van het Burgerlijk Wetboek en het Wetboek van Burgerlijke Rechtsvordering, in verband met de omzetting van Richtlijn 2014/104/EU van het Europees Parlement en de Raad van 26 november 2014 betreffende bepaalde regels voor schadevorderingen volgens nationaal recht wegens inbreuken op de bepalingen van het mededingingsrecht van de lidstaten en van de Europese Unie (Implementatiewet richtlijn privaatrechtelijke handhaving mededingingsrecht), Staatsblad 2017, 28. 56 Concept regeling, Wetsvoorstel wijziging Mededingingswet in verband met markt en overheid, concentratietoezicht en privaatrechtelijke handhaving. 57 Decision by the Court of Central Netherlands of 10 July 2013, ECLI:NL:RBMNE:2013:3245. 58 Decision by the Court of Central Netherlands of 30 December 2013, ECLI:NL:RBMNE:2013:7536.